What a fantastic weekend!!! Our friends Jo and Ben who we met in the rally came to visit us and we had an amazing time. Jo and Ben are both nurses and Jo is also a psychologist (which comes in handy as I am dealing with empty nest syndrome and house selling stress lol). They decided they wanted to try travel nursing so they sold their house in the mountains near Colorado (in three days grrr) and started working on the road out of their Arctic Fox. 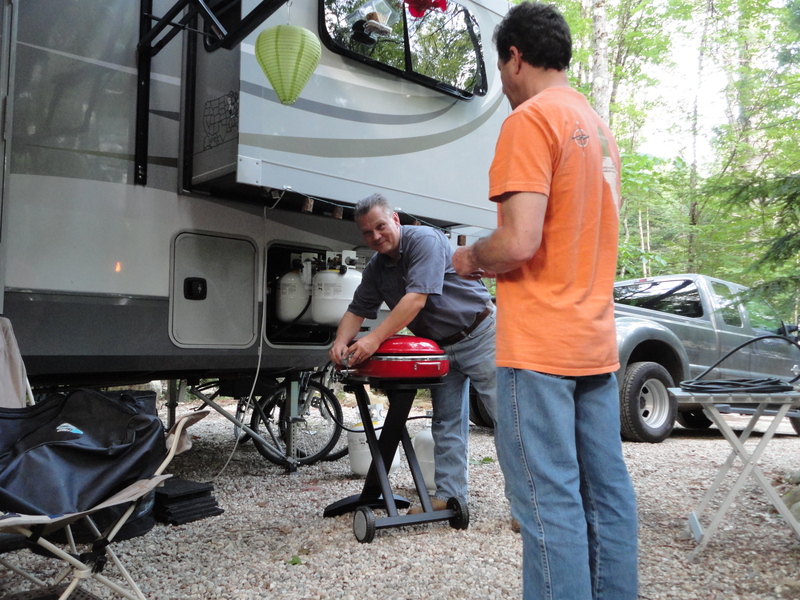 They are very experienced campers but new to the Full Time RV lifestyle and picked the coast of Maine as their first assignment. Ben is a trauma nurse so it’s easier for him to find contracts, but it was a bit tougher for Jo as she is not licensed as a psychologist in Maine and had not practiced nursing in a year or so. Plus people think postcard New England ,and it is beautiful, but culturally and environmentally it’s quite a bit different from the wide spaces of the west they are used to. Luckily we can relate. Even though we have lived here for 14 years, it’s still very different from the Midwest environment we are used to. The main thing about New England if you have to think in terms of the 5 states (New Hampshire, Mass, Vermont, Maine, and Rhode Island). There are lots of cool stuff to do, but you need to cover all the states to see everything. They’ve been staying pretty close to home in Maine, but we gave them some of our favorites including Newport, RI, Mount Washington, and Stowe Vermont. Those are places we have gone back to over and over and still enjoy. 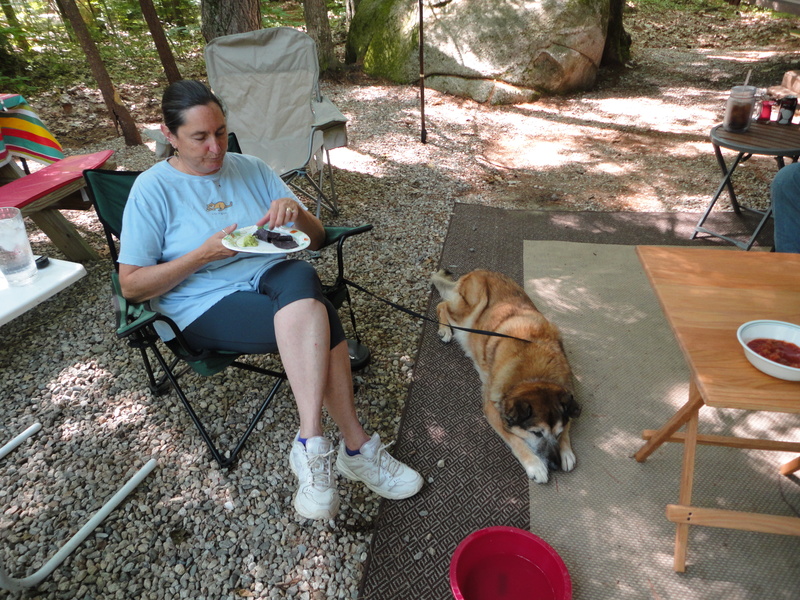 They did get to see Moosehead Lake and saw a family of moose, which I am incredibly jealous of, and had a wonderful camping experience new Acadia National park. Not only do they have their 5th wheel but they also have a second truck with a pop-up camper on the back. They take the little truck (with their two dogs) everywhere and it allows them to boon dock and reach areas they could never get to with the big trailer…brilliant!! We spent Saturday talking to Jo and Ben from 9am to 10 pm and never ran out of things to talk about. 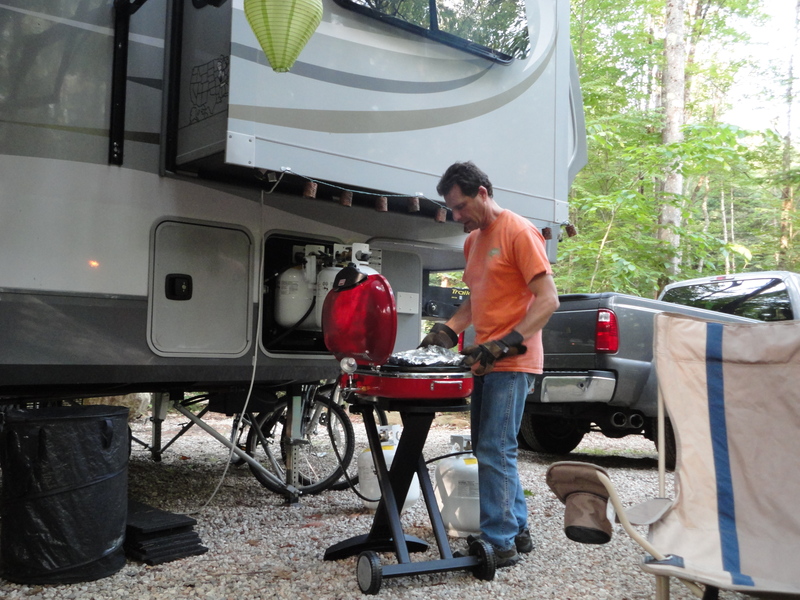 We are fascinated by their new lifestyle and what it takes to work on the road. It’s a weird dynamic because despite what it looks like you are not on vacation. You take your real life issues with you, but you have a freedom and flexibility that few who live in a sticks and bricks house will ever know. Most of the couples we met at the rally are either retired or have sufficient investments that working is somewhat optional. Jo and Ben are still carrying some student debt so working is a requirement for them. It was great talking to them though because despite the challenges they are making it work and I find them extremely inspirational as a couple. Plus they are both really interesting people and very fun to hang out with. Jo brought haddock with her straight from a dockside stand close to Kennebunkport where they are staying. I went to the local farm around the corner from our house and bought all the fresh vegetables they had so we had a fantastic meal. 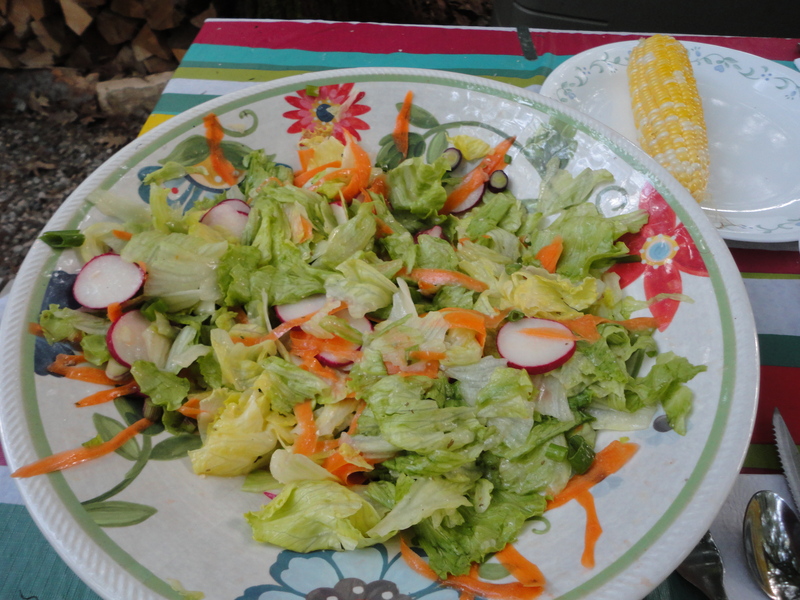 I made this yummy salad with fresh lettuce (amazing), radishes, and green onions straight from the ground. 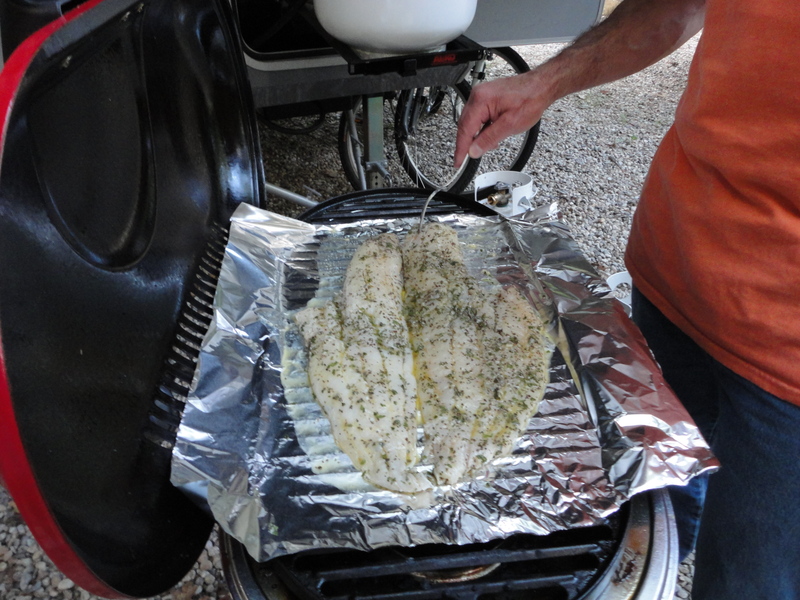 I have been wanting to learn how to cook fish on the grill..and Ben is a super fisherman…so Jo marinated it and Ben set to showing me how to cook it. 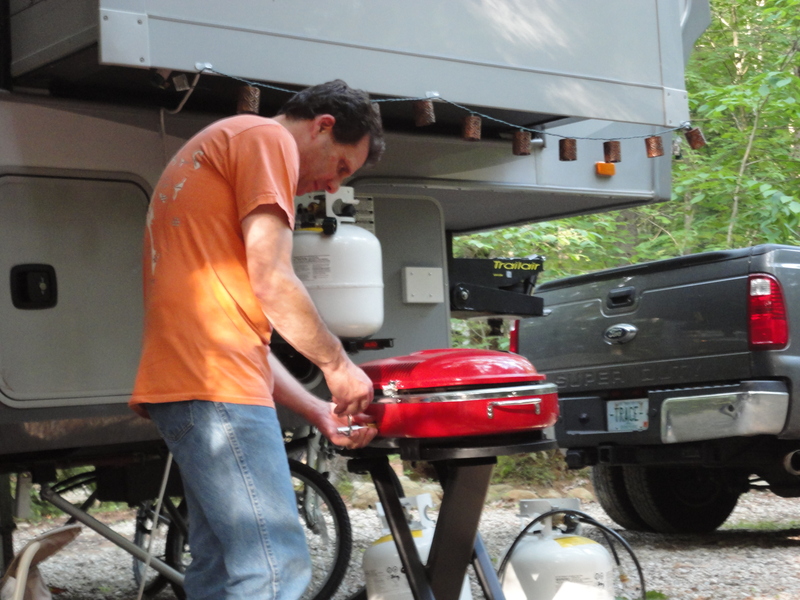 One problem, the Coleman grill we have only used twice would not stay lit…so Ben and Lee troubleshoot it while Jo and I laughed a lot. The wine made things quite merry 🙂 Here’s some pictures showing the troubleshooting and how it stopped working in mid-grilling and we had to move the fish to the fire and then back again to the grill once they got it going again. 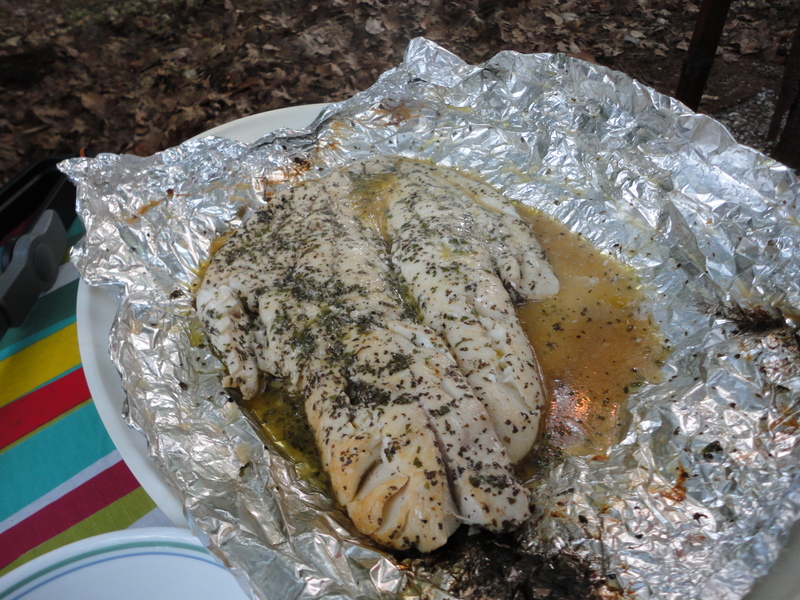 Despite the cooking crazy the fish was amazing!!! Right after dinner we got a call from Kelly and Bill and Cori and Greg. They were two other couples we had met at the rally and coincidentally were getting together Saturday night. I know I’ve said it before but the quality of the friendships we made from the rally are beyond anything I have ever experienced in a group setting. We all love the same things. 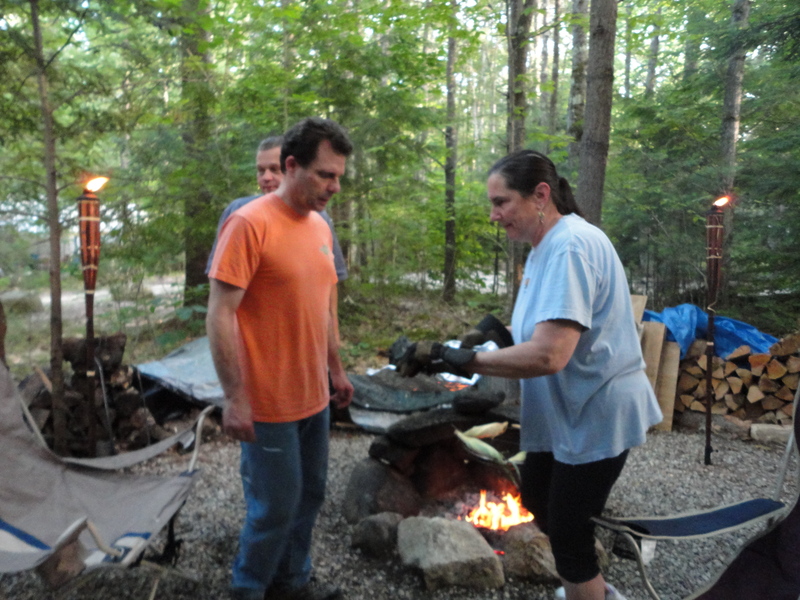 We will be driving up to visit them in Maine in a few weeks and four couples will be meeting in Pennsylvania in August. Also many of us have signed up for the RV-Dreams reunion rally in May. Love, love, love these friends!! Check out TravelTax.com for an accountant Jo and Ben recommends who specializes in providing tax assistance to people who travel and work. This is super simple and one of Lee’s all time favorites. 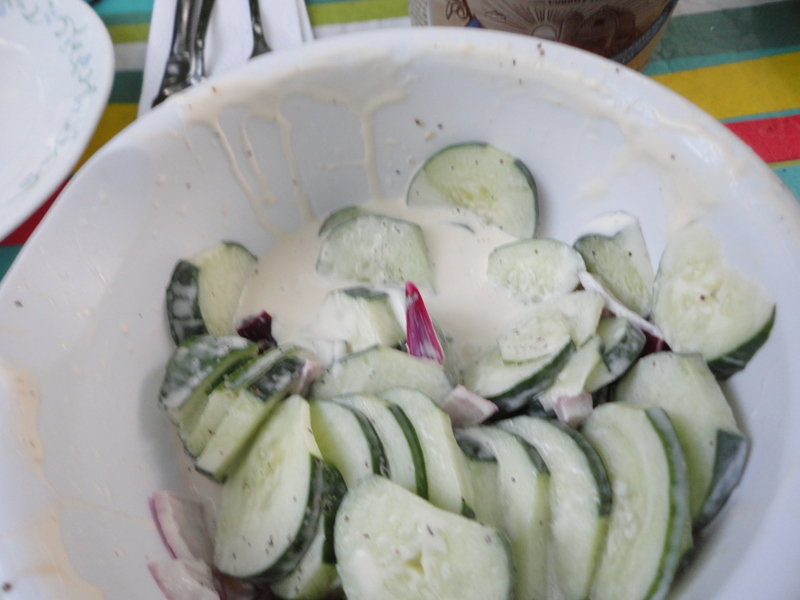 or best taste use farmer’s market cucumbers. Shake again. Continue until you can see some pepper flakes in the sauce. 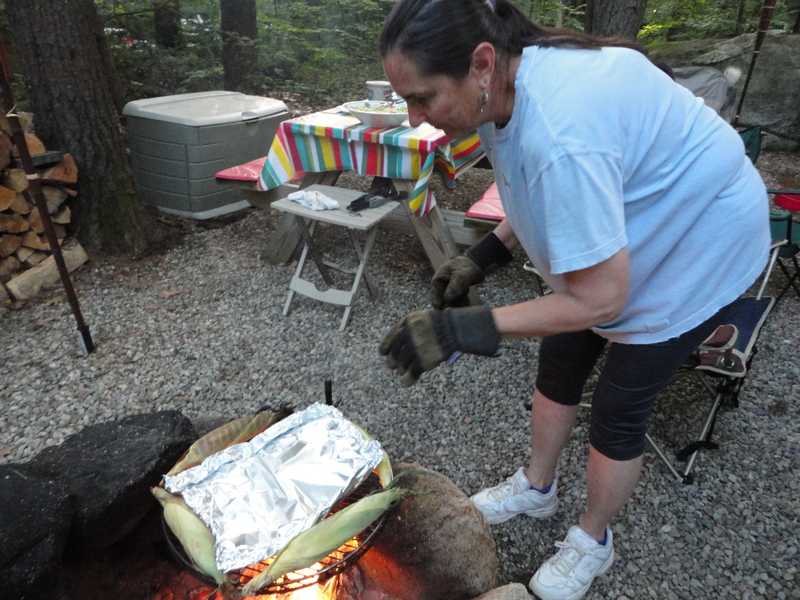 This entry was posted in Uncategorized and tagged camping recipes, RV-Dreams Rally Friends, Swanzey Lake Campground, Travel nurses. Bookmark the permalink. Hey Sue!!!! Lee was giving me a hard time this weekend because I haven’t made your dip yet so I promised in the next couple of weeks :). Miss you all….our travels have been beautiful, but I miss the fun and laughter of being with friends! Already looking forward to May 2015…hugs! 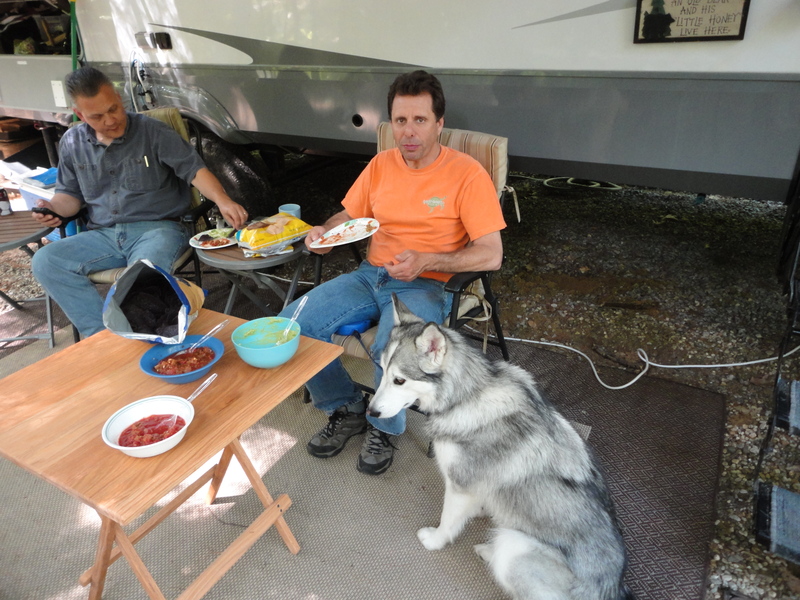 Us too…we all keep saying when are Pam and Red getting back from stinky Alaska they can hang out with us lol. Yes any kind of corn chip will burn great – Fritos too. We had such a great time with you guys! Loved that we could hang out and talk all day and never run out of things to talk about 🙂 Can’t wait to meet up with everyone in August. Hello to you all! Steve and I FINALLY made it OUT!! We’ve been fulltime for 4 days now 🙂 The past 2 months have been brutal! (that’s why no one has heard from us). I need to do some serious updating to my blog! BUT, Allen & Donna Ferguson (Fergizmo) paid us a surprise visit today and it was so nice to meet them in person! I’ve been missing reading everyones blogs. Need to catch up on that too!